Sell Used Books Online - Get The Most ValueEliminate The Muda! Many blogs and personal finance specialists speak of the value of getting rid of the clutter in your house and generating income in the process. While the cash generated from a successful yard sale can be exciting, the time, effort and energy that goes into a yard sale always made me question if we were making a good choice. I had conducted several yard sales over the years but it never failed that a pile of stuff was left remaining. This was generally donated to a local charity with a representative value being deducted from our taxes. Several years ago while doing our taxes we came across a software program called It’s Deductible. We discovered that we had greatly underestimated the market value of our donations as a result of using this software. With the values we were seeing in this program we concluded that all things considered we and our local charities were better off if we simply donated 100% of our unwanted items. Being a family of voracious readers books are generally the largest single category of donations for us. If you are eligible to itemize deductions, books can be a great source. Based on the values provided by It’s Deductible last year, hardcover books with high value were worth $5.00 and medium value worth $2.50. For soft cover the books were worth $4.00 and $2.00 for high and medium value respectively. What this means to your pocket depends on your tax rate. With a 15% tax rate every dollar deducted effectively puts $.15 in your pocket and at a 35% tax rate you get $.35 per dollar. Therefore a $5.00 deduction is worth from $.75 to $1.75 respectively. Primarily because so few books were even eligible, I am not sure I would waste any more time typing in all the data necessary. Another option available in most markets it a used book store. This is an option we used in the past when we lived in California. At that store they would pay 1/3 of the list price printed on any book and sell books for 1/2 of the list price. We enjoyed this option because the store was convenient to our home and we saw it as a frugal way to fulfill our desire to read. Now we live in Georgia and the nearest used book store is not so convenient but considering this post I figured it was worth looking into. This book store does things a little differently. First they won’t take any book you bring in, only those they want. Using the same list of books above several were not even eligible including 365 Ways to Live Cheap, The Millionaire Next Door and The 39 Clues Book. Prices for the remaining books were offered in two ways. You could either get store credit or cash with cash being a smaller figure. While there was some variation based on what the proprietor thought they could sell the books for, generally he would provide 1/4 of the list price in store credit or 1/6 of the list price in cash. 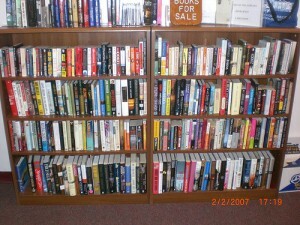 Again prices varied based on demand but looking at the shelves he would usually mark his books at 1/2 the list price. The last option I have considered is selling the books myself on-line. With this option there seems to be only 2 real choices including Amazon and Half.com |(owned by e-bay). In both cases you can sign up for an account easily enough and then enter your books using the ISBN (book serial number). This makes loading a snap. Neither is an auction, you do set the price you are willing to sell the book for. The real difference is in the fees and commissions between the two. It is obvious that given an equal selling price that Half.com will put more money in your pocket. *Not reflected in this chart is that Half.com charges more for shipping than what they credit you for. They will retain another $.22 to $.92 on each item. My thinking is: to generate some cash in excess of the benefits of the tax deduction without too much pain and agony would be welcome. However, beyond the fees and costs of shipping we also need to factor potential selling price and likelihood of actually selling the books. Who has more traffic to their site? TrafficEstimate.com estimates ebay has had 55,564,000 visits in the past 30 days while Amazon received 46,892,000. The challenge here is that we don’t know how much of the traffic gets pushed to the used books and more importantly to your books. Alexa and TrafficEstimate.com see Half.com as E-Bay. My guess is that you would get much more exposure with Amazon however because it is known as a book site. The drawback is you have a lot more competition on Amazon with other sellers. As an example for the book The Millionaire Next Door, there are 21 matches while on Amazon there are over 470 used books listed! Based on this it appears I hit the jackpot with one collectible book. However, I am more interested in getting the maximum value for an entire inventory of books we go through each year. To summarize let us look at one chart with all possibilities listed in terms of cash in pocket. To be fair I think we must exclude the one collector book, it throws everything off. With the remaining books it appears that it may be a toss up between Amazon and Half.com depending on the final selling price. By far both of these options appear to be better than simply selling the books outright or donating them to a charity. Based on this I figured I would have to set up accounts with both Half.com and Amazon listing similar books on both to get a real life sense of how fast the books actually sell and how difficult the process and obtaining payment is. It took about 30 minutes to get signed up with Half.com and list 18 books consisting mostly of children and romance novels. Their minimum listing price is $.75 and I learned that with the click of a button every listing will also be placed on eBay. In less time I was signed up with Amazon but quickly became discouraged. Virtually every book (more children and romance novels) I tried to list had dozens if not hundreds of sellers with a minimim price of $.01. These sellers are typically book stores from around the country. It turns out that you can pay about $40 a month to Amazon and become a Pro Merchant. For this fee you no longer have to pay the $.99 closing fee on every sale. With a $.01 price, the 15% commission is a non-issue. However you are still obligated to a $1.35 closing fee, therefore you are only guaranteed $2.65 in revenue including the $3.99 shipping credit. With this you have to pack and ship the book. Checking the USPS site it appears the best you can do this for is $1.62 with a business account and then you also have packaging materials and labor. For a $1.00 a book, considering all the time effort and energy a donation and a tax write off is suddenly looking much better. In the end I have decided to add the remaining books in the pile to Half.com. We’ll see what happens, whatever does not sell will be going to the local and school libraries. How about you? Have you sold books with either of these sites? Do you have another method of unloading your old books? Please share your experience below by leaving a comment with your experience or advice. Sell Used Books Online – Part II « Eliminate The Muda!